This edition was launched April 14th 2017 and can still be mail ordered for delivery to your adress. 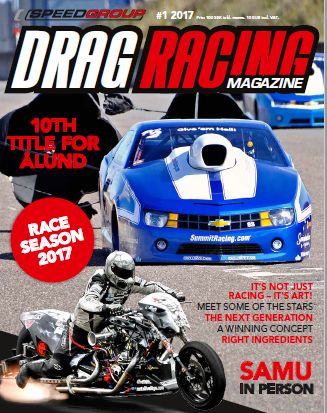 The Speedgroup Drag Racing Magazine is a printed, bi-lingual magazine (English and Swedish). 112 pages with an exclusive design. We hope this will be a magazine you wish to return to over and over again! Order your copy of Speedgroup Drag Racing Magazine below. We use PayPal´s payment solution online with multiple payment options via debet- or creditcard. You do not have to have a PayPal account. We have placed FAQ and answers at the bottom of this page. Magazine inkl. porto Sverige. 6% moms tillkommer. Vid annat antal, kontakta oss! Includes postage to any country. 6% sales tax is additional. What focus does the magazine have? Can the magazine be read online as an e-publication? – No, it comes in printed format only. Can the magazine be bought in stores or other places? – It can be bought at events Speedgroup is present at, races and exhibitions. In addition, we will co-operate with race teams and organisers active in the series and championships and make it available at as many events we can. Feel free to contact us at magazine@speedgroup.eu to inquire if there are options close to your location other than mail order. Can I sign up to receive the next edition automatically? – We don´t yet offer a subscription service. However, if you ordered edition #1 online and entered your email address in the process, we will send out an email alert to you when the next edition is published. How often is Speedgroup Drag Racing Magazine published? – The plan was initially to publish two editions per year. However for cost reasons, only one edition was produced. For 2018 digital solutions are looked at, meanwhile our websites are filled continuously with news and feature articles. How many copies is the magazine printed in? – It was printed in 20 000 copies. Who is the publisher and producer of the magazine and where is it printed? – Speedgroup is the publisher and for the design and production we have chosen to work with one leading Nordic publishing company Förlags AB Albinsson & Sjöberg in Sweden. They have many titles in their portfolio, among others the magazines BILSPORT, Allt om MC. www.fabas.se The magazine was printed in Vimmerby, Sweden.